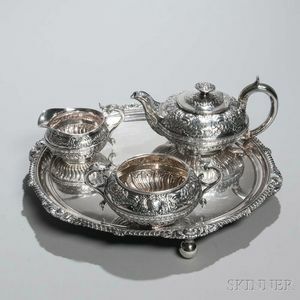 Three-piece George III Sterling Silver Tea Service with Associated Silver-plate Tray, London, 1819-20, Robert Hennell II, maker, squat forms with chased floral sprays to the shoulder and inverted gadroons to base, with engraved armorial, teapot, sugar, and creamer, teapot ht. 4 3/4, approx. 44.5 troy oz., on a circular silver-plate salver, dia. 16 in.